It’s one thing to say we support our U.S. Military, but it’s another to show it. 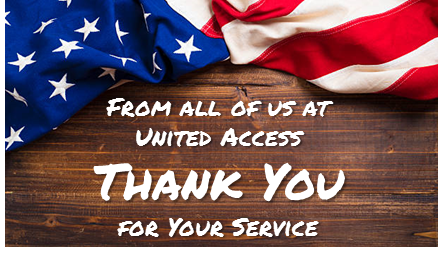 At United Access, we do everything we can to show our support. That includes helping veterans through the grant process and working with the Department of Veterans Affairs to help them obtain the proper grant funding for wheelchair accessible vehicles, offering veteran discounts on wheelchair accessible vehicle rentals, and partnering with veteran support organizations like the Paralyzed Veterans of America and Wounded Warrior Project. We are just as proud of our veteran employees. About ten percent of our workforce is comprised of military veterans. The military trains people to lead by example as well as through direction and inspiration. Veterans also understand the dynamics of leadership and that teamwork grows out of responsibility and camaraderie. These are qualities we look for in our employees and values we hold in high regard in our company. Jonah, Service Manager in the Dallas area, has been with United Access since 2014. He was a Staff Sergeant in the U.S. Marines. Jonah started as a part time porter and quickly worked his way up to the Service Manager position. Andrew served as a Major in the U.S. Army. Andrew now works with us as a Mobility Specialist in the Dallas area. Van started his career at United Access in 2015. Van was a Corporal in the U.S. Marines and now works in the Cape Girardeau area as a Service Manager. Showing even further commitment are the men and women who continue to dedicate their lives to serving our county. One such young man, Brodie, is the son of our General Manager in our Springfield, Missouri store. 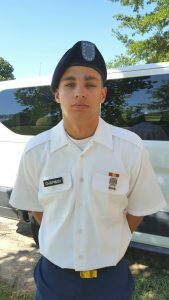 Brodie graduated last month from 2nd Battalion, 39th Infantry U.S. Army. He was the third youngest in his company (leaving for boot camp 5 days after high school graduation). During that time he earned the Sharpshooter Pin in Marksmanship. Brodie will be heading to college in January. After he earns his degree, he plans to go on active during with the hopes of completing Airborne and Ranger school. Supporting our troops isn’t just a thing we say, it’s a part of who we are as a company.